Autumn Alcott Ridenour offers a Christian theological discussion on the meaning of aging toward death with purpose, identity, and communal significance. 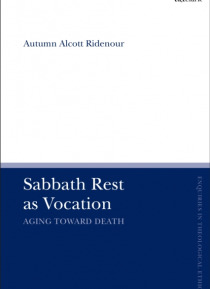 Drawing from both explicit claims and constructive interpretations of St. Augustine's and Karl Barth's understanding of death and aging, this volume describes moral virtue as participation in Christ across generations, culminating in preparation f… or Sabbath rest during the aging stage of life. Addressing the inevitability of aging, the prospect of mortality, the importance of contemplative action and expanding upon the virtues of growing older, Ridenour analyzes how locating moral agency as union with Christ results in virtuous practices for aging individuals and their surrounding communities. By responding with constructive theology to challenges from transhumanist, bioethical and medical arenas, the volume highlights implications not only for virtue ethics, but also for the goals of medicine.